Known as a leading manufacturer of superior cast iron cookware, Lodge Manufacturing’s revolutionary Cook-It-All won the first annual Housewares Design Innovation of the Year award. Judges selected the Cook-It-All from the 11 “Best in Category” housewares winners. The announcement was made on Tuesday, Jan. 29, at the Las Vegas Market in Las Vegas. In addition to the Innovation of the Year award, Lodge won the Design Innovation of the Year award in the Cookware and Bakeware category. Products in the competition were selected by an independent panel of design and merchandising experts who conducted testing on hundreds of products in 11 categories, including Cookware and Bakeware, Countertop Beverage Appliances, Countertop Cooking & Food Prep Appliances, Cutlery & Cutting Tools, Dining & Entertainment, Smart Home and more. Released in August 2018 and produced in Tennessee, the Cook-It-All brings unmatched versatility to campsites and the act of cooking over an open fire. Featuring five cooking configurations from only two pieces of cast iron, users can grill, griddle, sauté, bake and even make pizza. Configurations include a 6.8-quart skillet/wok, a pizza oven, a camp Dutch oven and a 14-inch grill and griddle. The Cook-It-All is available for purchase on the company’s website, www.lodgemfg.com, and at Lodge Factory Stores. Founded by Joseph Lodge in 1896, Lodge is the oldest family-owned (and operated) cast iron cookware company in the United States. The 123-year-old company produces more than 100 different cast iron cookware items in its two South Pittsburg, Tn. foundries. Lodge employees over 400 American workers. 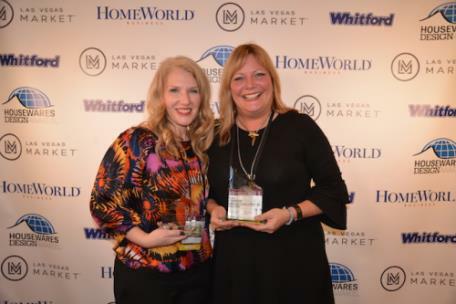 Lodge Product Development Manager Carey Garland (L) and Vice President of Marketing Susanne Champ with the two trophies the company received at the first annual Housewares Design Innovation of the Year awards January 29 in Las Vegas. Lodge won the Design Innovation of the Year for the Cook-It-All in a contest with winners of 11 different Housewares Industry categories. The company also won took top honors in the Cookware and Bakeware category.